Eternal Orthodox Church calendar for the 08.09 year 2017. 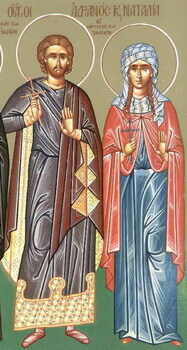 Husband and wife, they were both of noble and wealthy families in Nicomedia. Adrian was the governor of the Praetorium and a pagan, and Natalia was a secret Christian. They were both young, and had lived in wedlock for thirteen months in all before their martyrdom. When the wicked Emperor Maximian visited Nicomedia, he ordered that the Christians be seized and put to torture. There were twenty-three Christians hidden in a cave near the city. Someone handed them over to the authorities and they were cruelly flogged with leather whips and staves, and thrown into prison. They were then taken from prison and brought before the Praetor for their names to be noted. Adrian looked at these people, tortured but unbowed, peaceful and meek, and he put them under oath to say what they hoped for from their God, that they should undergo such tortures. They spoke to him of the blessedness of the righteous in the Kingdom of God. Hearing this, and again looking at these people, Adrian suddenly turned to the scribe and said: "Write my name along with those of these saints; I also am a Christian." When the Emperor heard this, he asked him: "Have you lost your mind?" Adrian replied: "I haven"t lost it, but found it!" Hearing this, Natalia rejoiced greatly, and, when Adrian sat chained with the others in prison, came and ministered to them all. When they flogged her husband and put him to various tortures, she encouraged him to endure to the end. After long torture and imprisonment, the Emperor ordered that they be taken to the prison anvil, for their arms and legs to be broken by hammers. This was done and Adrian, along with the twenty-three others, breathed his last under the vicious tortures. 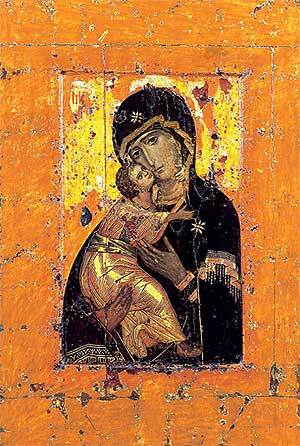 Natalia took their relics to Constantinople and there buried them. After several days Adrian appeared to her, bathed in light and beauty and calling her to come to God, and she peacefully gave her soul into her Lord"s hands. 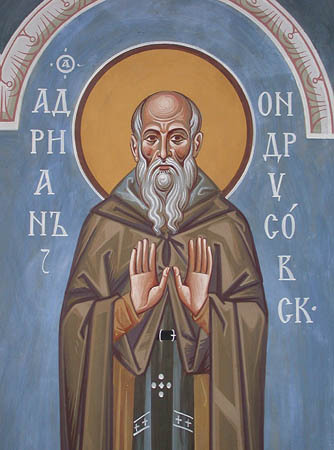 A disciple of St Pachomius and great among the Egyptian ascetics, he was abbot of Tabennisi. He spent his whole life in absolute purity. One of the brethren once asked him: "What path leads to humility?" To this Tithoes replied: "The path to humility is, abstinence, prayer and the considering of oneself as the least of all creatures." He reached a very high peak of perfection and, whenever he raised his hands in prayer, his spirit entered into ecstasy. He entered into rest in the fourth or fifth century. Our Holy Father Ibistion is commemorated together with him. This is recorded in the passage for consideration below. Under today's date in the Greek Synaxarion is also found the life of St Josaphat, the heir of the King of India. In the Slav Prologues, though, as in this one, he is to be found under November 19th.